In a small bowl, combine brown sugar, water, vanilla, and kosher salt, stirring to combine (don't worry that the sugar and salt won't all be dissolved). Set this at-the-ready, next to your stove, as this recipe goes really quickly. In a medium-large saucepan over medium heat, toast pecans for 2-3 minutes, stirring occasionally to prevent burning. When you begin to smell a lovely, nutty aroma, they're done. Quickly drizzle the sugar mixture into the pan, on top of the pecans, stirring the nuts as you drizzle. Stir constantly for about 15 seconds, until the pecans are thoroughly coated in the sugar mixture. Immediately remove from heat so they don't burn. 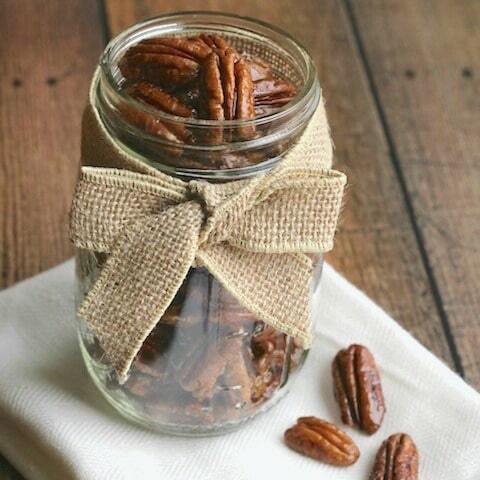 Spread the pecans on a piece of parchment to cool. Once cooled, you can break the nuts apart, if needed. Enjoy immediately or store in an airtight container. The pecans will be slightly sticky at first, but the coating hardens further within a few hours. © 2014 Two Healthy Kitchens. All rights reserved.